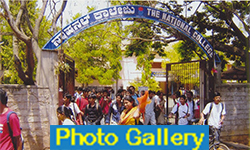 The college offers a course in Computer Applications (BCA). The duration of the course is six semesters. Each semester is of 5 months duration. Any candidate who has passed the PUC examination (or10+2) scoring a minimum of 40% of marks in aggregate in any discipline is eligible for admission to BCA. Which has an intake capacity of 60 students.